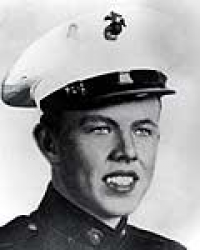 Corporal John Peter Fardy (15 August 1922 - 7 May 1945) was a U.S. Marine who was posthumously awarded the U.S. military's highest award for valor, the Medal of Honor, for his heroic actions during World War II. John Peter Fardy was born 15 August 1922 in Chicago, IL. Educated in the schools of Chicago, he graduated from high school in 1940. After graduation, he took a course in typing at the Fox Secretarial College; a year later he entered the Illinois Institute of Technology. He majored in mechanical engineering, but left after the first year. He had been doing time-study work previously, so he went to work at the Cornell Forge Company as a time-study man and draftsman. Inducted into the Marine Corps on 8 May 1943 at Chicago, he went through recruit training at the Marine Corps Recruit Depot, San Diego, CA. Upon completion of recruit training he was, at his own request, assigned to the Japanese Language School. He was promoted to Private First Class in July, about two weeks before the start of school. After one month of attendance at the language school at Camp Elliott, San Diego, PFC Fardy was transferred to the Infantry Battalion where he was trained as an automatic rifleman. Private First Class Fardy joined the 29th Replacement Battalion shortly before the unit left the U.S. on 28 October 1943. He journeyed to Nouméa, New Caledonia, and was reassigned to the 27th Replacement Battalion, which was leaving to join the 1st Marine Division. Attached to Company C, 1st Battalion, 1st Marines upon his arrival at Goodenough Island, D'Entrecasteaux Islands, early in December 1943, PFC Fardy left with that unit about a week later for Nascing, Alatu, New Guinea. The stay there was a short one, for the 1st Marines left Finschaffen on Christmas Day 1943, for their 26 December landing on enemy-held Cape Gloucester, New Britain. Within two months of the time he left his home shores, the former draftsman was involved in a battle for an enemy airdrome on an island rarely heard of before. Following the Cape Gloucester operation, and the return of the 1st Marine Division to the Russell Islands for over three months training, the division left for Peleliu. After practice landings at Guadalcanal, the division landed on the coral-studded, shadeless Peleliu. PFC Fardy participated in the capture of the airport and the attack on the coral hills overlooking it before returning to the Russell Islands with his regiment in early October. Promoted to Corporal on 21 December 1944, the veteran of two campaigns became a squad leader as the reorganized division started training for the next operation. The training ashore ended in February and the Marines embarked aboard the ships that took them for practice landings at Baniki (Russell Islands), Guadalcanal, and Ulithi Atoll in the Caroline Islands. The landing on Okinawa occurred on Easter Sunday, 1 April 1945 and the division's sweep across the island up to the northern tip was accomplished with comparative ease. Later, Marines were moved south to help hard-pressed Army troops. It was on 6 May 1945 when Company C was advancing against a strongly fortified, fanatically-defended Japanese position that Cpl Fardy's squad was suddenly brought under heavy small-arms fire. Cpl Fardy temporarily deployed his men along a drainage ditch. Shortly afterwards, an enemy hand grenade landed in the ditch, falling among the pinned-down Marines. Instantly, the 21-year-old corporal flung himself upon the grenade and absorbed the exploding charge with his own body. Taken to a field hospital, Cpl Fardy died the next day. For his heroic self-sacrifice, he was posthumously awarded the Medal of Honor. 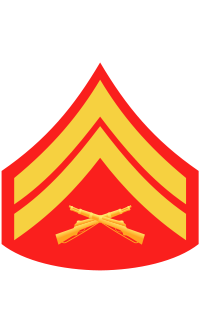 Rank and organization: Corporal, U.S Marine Corps. Place and date: Okinawa Shima, Ryukyu Islands, 7 May 1645. Citation: For conspicuous gallantry and intrepidity at the risk of his life above and beyond the call of duty as a squad leader, serving with Company C, 1st Battalion, 1st Marines, 1st Marine Division, in action against enemy Japanese forces on Okinawa Shima in the Ryukyu Islands, 7 May 1945. When his squad was suddenly assailed by extremely heavy small arms fire from the front during a determined advance against strongly fortified, fiercely defended Japanese positions, Cpl. Fardy temporarily deployed his men along a nearby drainage ditch. Shortly thereafter, an enemy grenade fell among the marines in the ditch. Instantly throwing himself upon the deadly missile, Cpl. Fardy absorbed the exploding blast in his own body, thereby protecting his comrades from certain and perhaps fatal injuries. Concerned solely for the welfare of his men, he willingly relinquished his own hope of survival that his fellow marines might live to carry on the fight against a fanatic enemy. A stouthearted leader and indomitable fighter, Cpl. Fardy, by his prompt decision and resolute spirit of self-sacrifice in the face of certain death, had rendered valiant service, and his conduct throughout reflects the highest credit upon himself and the U.S. Naval Service. He gallantly gave his life for his country. The Medal of Honor was presented to Corporal Fardy's parents at ceremonies conducted by the Marine Corps League in Chicago on 15 September 1946. Corporal John Peter Fardy was killed in action on 7 May 1945. Corporal Fardy's remains were shipped back to the U.S. and re-interred on 7 April 1949 at Holy Sepulchre Cemetery in Alsip, Cook County, IL. Military honors were provided by the Chicago Detachment of the Marine Corps League.